It has been mentioned before, but we’ll go ahead and remind you once more. Not every model can be redesigned each year. It simply wouldn’t make sense for every car to get overhauled year after year, so automotive manufacturers like Toyota pick and choose which models need to get overhauled and which are impressive enough to remain the same in a given year. Even still, an entire lineup might have some minor enhancements each year, or some models might get slightly upgraded each year. That seems to be the case with the Tacoma, which always seems to be getting enhanced in some fashion year after year after year. 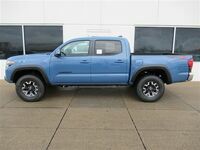 That brings us now to the 2019 Toyota Tacoma in Moline IL, a midsize pickup truck that has once again received quite a few enhancements for the new model year. 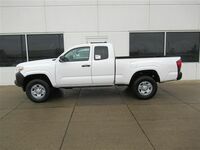 Currently being assembled at the Toyota Motor Manufacturing, Texas plant based out of San Antonio, the Toyota Tacoma has been the best-selling midsize pickup truck in the United States for the past twelve years. That’s an amazing accomplishment, and perhaps goes to show the success that Toyota has had in always enhancing the truck in some form or another. For the new model year, those enhancements are as simple as adding two USB ports to the center console and standardizing the Toyota Safety Sense package across the entire Tacoma family. Though there are some more exciting changes for the new model year as well. Although the regular Tacoma trim levels benefit from those subtle changes, the top-of-the-line TRD Pro model was completely revamped and upgraded for the model year. Additionally, the 2019 Tacoma adds a blacked-out SX trim level, bringing the Tacoma lineup to a whopping 32 possible configurations. Talk about customization options. 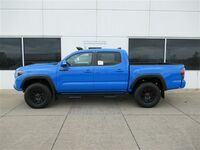 If you think you might be interested in a 2019 Toyota Tacoma of your own, regardless of which of those 32 configurations options you might want, be sure to get in touch with us right here at Hiland Toyota.